In an increasingly competitive student recruitment environment for law school, George Mason University (GMU) School of Law designed compelling programs to attract, accommodate, and retain students. GMU School of Law requires their Juris Doctor (J.D. ), Masters of Law (LL.M) degree and the continuing legal education (CLE) programs to be flexible and interactive to support the large population of international and continuing education students enrolled in them and the requirements set by the Virginia Bar Association. To accomplish this, classes need to be recorded and/or streamed live, incorporate engagement tools for interacting either online or in a traditional classroom and support accessible, on-demand content and recorded lectures. GMU School of Law selected Echo360 to meet these needs. Students have embraced the flexibility and interactivity of the programs and the on-demand access to content and videos to keep current with their courses. Faculty are also driving usage of the system and accessing new student learning data from Echo360 to adjust instruction for improved student outcomes. GMU School of Law was looking for ways to expand its enrollment, and the Masters of Law (LL.M.) degree program helped to achieve this goal. The program is especially popular for international students who make up 50% of the program’s enrollment. As many of these students are not native English speakers, the ability to replay the lectures with Echo360 is critical in helping them keep pace with the highly technical course content. Further, students can signal confusion with the course content to the faculty and get the support they need in real time. GMU’s School of Law also uses Echo360 to deliver continuing legal education (CLE) to practicing attorneys. The state of Virginia requires attorneys take twelve CLE credits each year to maintain their license, and at least four of those credits have to be online and interactive. Using Echo360, the CLE courses provided by the law school are streamed live and allow students to interact with their instructors, just as they would in a traditional classroom. This capability helps GMU satisfy the CLE requirements for both the American Bar Association (ABA) and the Virginia Bar Association, and accommodate the need for online, flexible courses for practicing attorneys with full-time jobs and other commitments. Considering the proximity to the nation’s capital, many GMU School of Law faculty members are working attorneys for the U.S. Government, whether at the Department of Justice or in the U.S. Congress. Because of the nature of their career, they are often called to testify at hearings on Capitol Hill in Washington, D.C., or have other work requirements that might otherwise keep them away from the physical classroom. To accommodate their busy schedules, the faculty can record their presentations with Echo360’s classroom or personal lecture capture and classes do not have to be cancelled or rescheduled. “Echo360 is a big part of our contingency planning. Since classes are recorded and available online for students, it allows them to watch on their own. We don’t have to cancel classes due to work requirements or inclement weather,” said Sandoval. 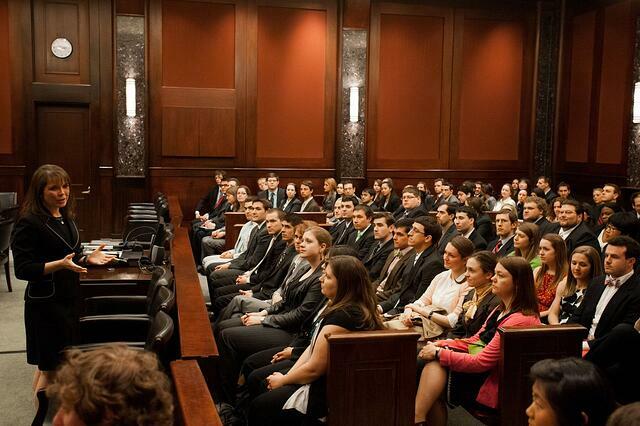 Additionally, the school makes extensive use of guest lecturers, many of who are high-profile jurists and attorneys. These presentations are often once-in-a-lifetime experiences for students. Sandoval and his team are able to record those guest presentations and make them available to more students and wider audiences. Learn more. Read how instructors at Western University make lectures more interactive and accessible to students and why students themselves named Echo360 their number one application.